I thought it might be a good time to share a handful of the Avid editing tips I've picked up over the years. These are in no particular order. Some may be new to you and some may be obvious, I hope if there are any that I have missed you will share them as comments. If this turns out to be a popular subject I will do future blogs with additional Avid Tips and Tricks. 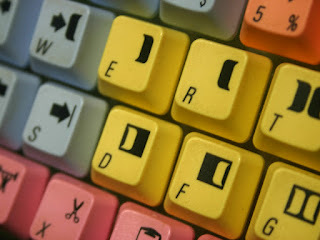 Note: I am using an Avid Media Composer on a Mac, so I will be referring to the modifier keys on the Mac. Keep in mind that the COMMAND key on the Mac does what the CONTROL key does on Windows. The OPTION key on the Mac does what the ALT key does on Windows. OPTION-Add Track - Holding down the OPTION key while choosing Add Track, allows you to insert a new track on any track. If you happen to already have clips on that track, it will ripple those clips to the next track. OPTION-Matchframe in Sequence - Sometimes I want to open the source clip used in a sequence, but I don't want the system to change the in and out marks I have in that clip. Using the OPTION modifier does not change in and out marks when loading the clip into the source monitor. OPTION-Copy to Clipboard - Copy and load clipboard contents to the source monitor. I like the copy to the clipboard function but have often felt like it's dumb to then have to go to the source and "Load clipboard contents" - it's a waste, why else would you need to copy something if you weren't going to actually use it. Holding down the Option key as you copy to the clipboard will automatically load the media to the source monitor. Better yet, add the Option modifier button to the key that has the clipboard and you can do the action in one step - no modifier. COMMAND-SHIFT-A in Timeline - A lot of you may use COMMAND-A (Select All) to highlight all of the tracks in a sequence. Did you know that adding the SHIFT key deselects all tracks in the timeline? SHIFT-Click Drag Track Selectors in a Sequence - Holding down the SHIFT key then clicking on a deselected track and dragging through the other tracks will select all of the tracks. If the initial track you click on is selected, this action will deselect all that you drag through. Keyboard Setting that Changes Timeline - If you're like me, you try to map everything you use on a regular basis to the keyboard. Did you know that there's a way to map Timeline Views to the keyboard? If you map a workspace to the keyboard, you can go under the Windows > Workspaces > Properties... menu, select "Link to Named settings" and enter in the name of the Timeline View setting. 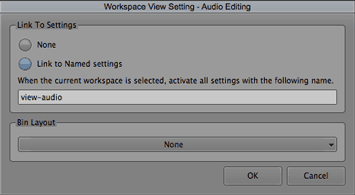 For instance, when I go to the "Audio Editing" workspace, all of the settings I have named "view-audio" are loaded as well. This includes a timeline with wider audio tracks with Audio Waveform and Volume Data visible. Subsys Monpane Debug - This is a very useful console command (subsys monoplane debug) - it allows precomputes to be loaded into source monitor. I've been using this since I was an editor at Avid, before mixdowns were brought back into the editing systems. These days, when I use this in an emergency, I will not edit a precompute into a sequence. Instead, I will load the precompute into the source monitor, export it and then import it back in. This allows me to get the clip back if the media is cleared out, and it severs all ties to the original sources reducing the object count in the bin and sequence. Transitions to Show up in the Quick Transition Menu - Is there a transition effect that you use over and over again and you're sick of adding a dissolve and changing the parameters to how you want it? 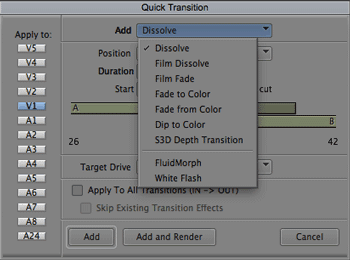 Well you know effect templates can be saved by dragging them to a bin, but did you know that if that bin is named "Quick Transitions", those effects will be a choice in the pull-down menu of the Quick Transition dialog? This will work even if the "Quick Transitions" bin isn't currently open. For more Avid Tips and Tricks, check out the blog entitled "Avid Editing Tips and Tricks - Part II" and keep the discussion going by adding any comments or tips you may have. My wish would be to shut off the autosave option for bins that are locked. I hate having to click "don't save" for 10 locked bins every 5 mins. I know they're locked!! I don't want to save them!!! Thanks, and you have a very good point. I'm actually preparing a blog of my wish list for 2013. It should go 'live' on December 24. That's my first wish. Second place is faster audio waveform loading. Why does it take so long? It's super fast on PRO TOOLS. Come on. If they can't do it then let me interrupt the load waveform function while it's still loading. Actually one of the items in next week's 'wish list' blog has to do with fast audio waveforms. It'd be much better as a non-interuptable process. I've never tried that. I'll have to put it in the next 'tips and tricks' blog.